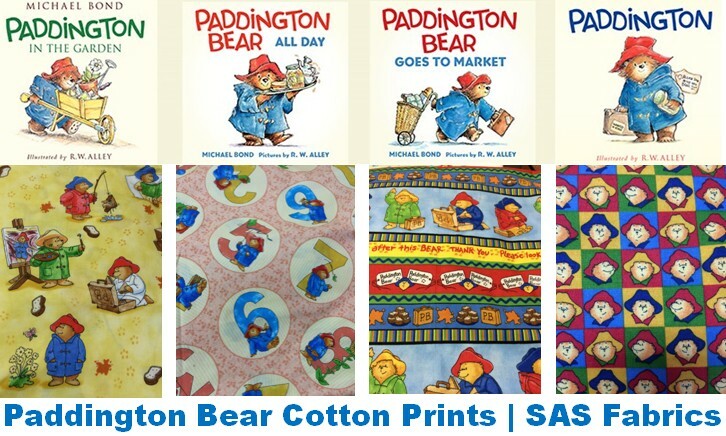 SAS Fabrics carries a huge selection of Paddington Bear cotton prints. Your children will love to be enwrapped in all things Paddington Bear – pillows, curtains, outfits, crafts. Make them something special because who can get enough of that cute and famous Peruvian Paddington Bear! Do you remember that series of beloved children’s books beginning with written by Michael Bond? It’s now a major motion picture from the producer of Harry Potter, David Heyman, starring celebrities like Nicole Kidman and Hugh Bonneville, and more. “A Bear Called Paddington has been in print uninterruptedly since its first release, and over 150 other titles have been released starring the iconic bear, including board books that are aimed at the very young reader. Playful mischief ensues in every tale. Each book embeds traditional British values, has a delightful charm and wit, and I feel is as enchanting today as when it was first penned. They have also been translated in to over forty different languages and Paddington Bear is popular all over the world, making Michael Bond one of the most successful children’s authors of all time.